Woodgears.ca is labeled as an "engineer's approach to woodworking", which does a rather good job of explaining it. We've been watching this site for a while and decided it was time to give it a plug. Created by Matthias Wandel (who seems to be a man of many talents), Woodgears shows off some of the most creative woodworking projects we've ever seen. 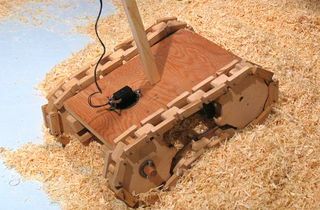 These projects, mostly created by Matthias, range from machines built completely of wood to some interesting woodworking jigs. He also has some very nice "regular" woodworking projects on his site like tables, chairs and beds. What's really great about Woodgears is that Matthias provides very detailed instructions on how he built the projects and some projects even have included videos. He also offers some nice plans for many of the projects, both free and paid. Below, we've listed some of the designs we've found most interesting. There's much more at the Woodgears site and you can see all the videos on the Woodgears Youtube Channel.